I first put an X-Acto blade to sprue somewhere around 1973. By 1975 I was a complete sprue junky spending most of my free time building and airbrushing airplane models: only airplane models. Being a certified wingnut, I’ve enjoyed a solid diet of scale aircraft (mostly 1/72) until this little Trumpeter Jadgpanther: my first armour model. As an airplane guy I had a few “moments” during the build like “Why are there so many #&$@%@ wheels!” and “Jeez this thing made a mess of my bench!”……but I digress. 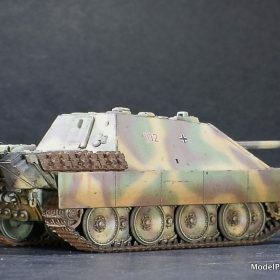 In short, building and painting this Jagdpanther was a blast 🙂 The build required me to learn some new techniques and unlearn some old ones and I’m a better modeler for the effort. Most importantly this build was really fun and that’s the universal bottom line. 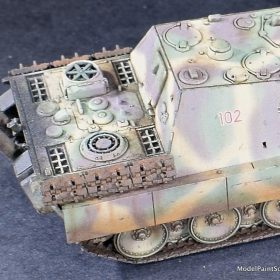 The Jagdpanther (German: “hunting panther”), SdKfz 173, is a tank destroyer based on the chassis of the Panther tank and manufactured by Germany during World War II. It entered service in 1944 during the later stages of the war on the Eastern and Western Fronts. 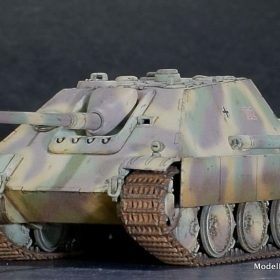 The Jagdpanther combined the 8.8 cm Pak 43 cannon, similar to the main gun of the Tiger II, and the armor and suspension of the Panther chassis. 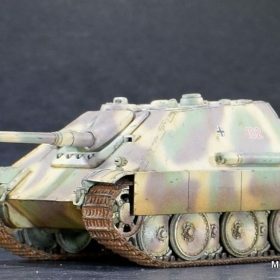 A product of late war production, the Jagdpanther suffered from poor production standards, marginal maintenance, and a shortage of spare parts. 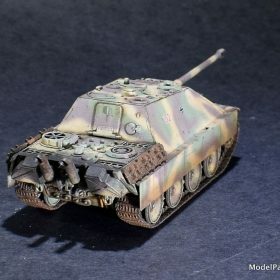 The Jagdpanther had been preceded by two attempts at mounting an 8.8 cm gun as a self-propelled anti-tank weapon: the Ferdinand using the 91 leftover Porsche-built VK 45.01 (P) chassis and the Nashorn, using a Panzer III/IV chassis. The Ferdinand proved to be too heavy and the Nashorn too lightly armoured and underpowered. 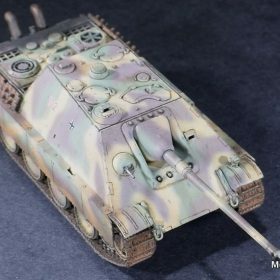 A heavy tank destroyer design based on the 8.8 cm Pak 43 gun and the Panther tank chassis was ordered in late 1942. The full-size model by Daimler-Benz was demonstrated in October 1943 before Hitler. MIAG-built prototypes followed in October/November 1943. 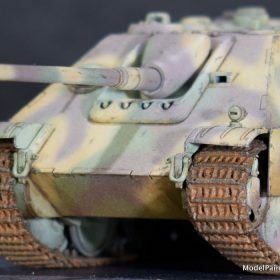 Jagdpanther production started in January 1944. 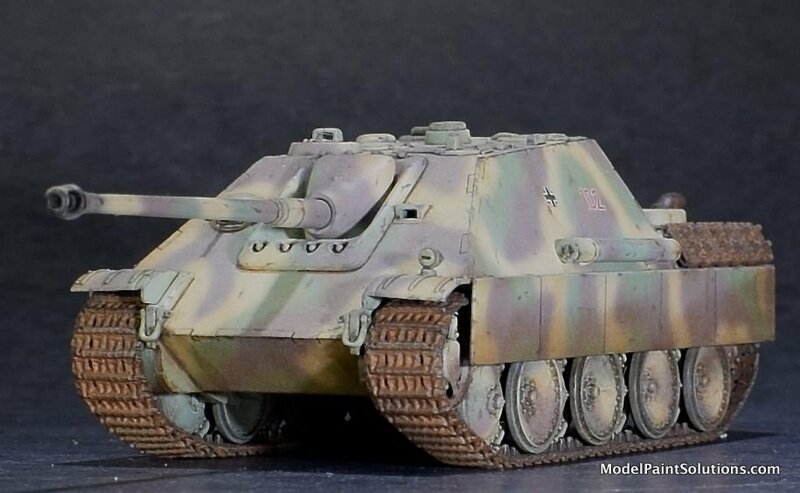 In February, Hitler specified the simpler Jagdpanther name instead of its original “8.8 cm Pak 43/3 auf Fahrgestell Panther”. 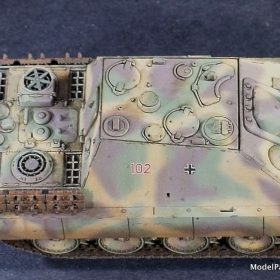 To accommodate the heavier-caliber gun, as on previous Jagdpanzer-style un-turreted tank destroyers, the glacis plate and sloped hull sides of the Jagdpanther were extended up into an integral, turretless fixed casemate as part of the main hull itself. This provided a roomy interior for the crew. 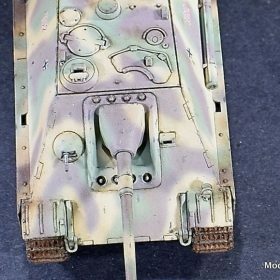 The Jagdpanther had side armour of increased thickness (50 mm) to offset the slightly reduced angle of the side armour necessary to provide enough interior space. Lower frontal hull armour was reduced to 60 mm while upper hull frontal armour was kept at 80mm. 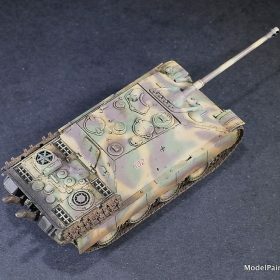 The chassis armour changes were also introduced on the main Panther tank assembly lines starting with the Panther Ausf G in the spring of 1944. The Jagdpanther was armed with the long-barreled 8.8 cm Pak 43/3 L/71 gun, similar to the main gun of the Tiger II “King Tiger”. The gun was mounted in a central mantlet, which gave it a limited traverse of 12 degrees to each side. A single 7.92 mm MG 34 machine gun for local defense was mounted in a ball mount on the right side of the front glacis plate. The machine gunner was also the wireless operator. The driver sat on the left. The gunner had a rangefinder and a periscope telescopic sight. The periscope – linked to the gun mount – was under an armoured housing on the roof. 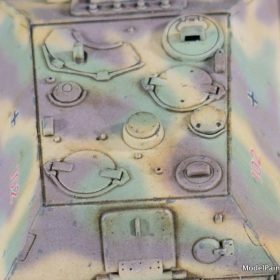 The two main variants of the Jagdpanther, G1 and G2, can be distinguished by the following features. The earlier G1 1944 model had a small welded main gun mantlet, a one-piece Pak 43/3 gun, a modified Panther A engine deck, and two vision openings for the driver. The G2 used a Panther Ausf. G engine deck, a larger gun mantlet bolted externally (to cut down on production time? ), and a two-piece KwK 43/4 L/71 gun. 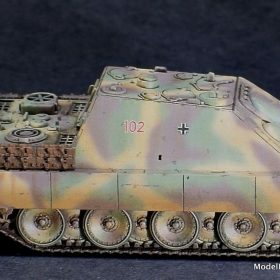 Some later G1 models may have possessed G2 features such as the larger G2 mantlet because changes to the design were implemented gradually and lack of spares turned many Jagdpanthers into hybrids. Zimmerit was applied to G1’s up to September 1944, when it was withdrawn for fear of fire risk and to speed up production time. Early Jagdpanthers had two vision openings for the driver, whereas late versions had only one. The main gun originally had a monobloc gun barrel, but from May 1944 on this was gradually replaced by a two-part barrel, which was more economical as barrel wear was not even. A total of 415 Jagdpanthers were produced by three manufacturers. MIAG in Braunschweig produced 270 from January 1944 until the end of the war. Maschinenfabrik Niedersachsen-Hannover (MNH) produced 112 from November 1944. And, Maschinenbau und Bahnbedarf (MBA) in Potsdam produced 37 vehicles from December 1944. Planned production had been 150 a month, but the disruption to German manufacturing had made this impossible. 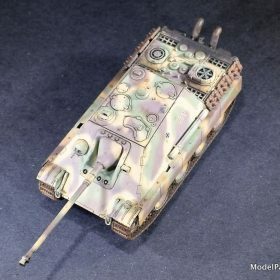 The last ‘production’ Jagdpanthers were produced at the factory by German staff just after the end of World War II under the supervision of the Royal Electrical and Mechanical Engineers (REME) using available components. 9 Panthers and 12 Jagdpanthers were produced and shipped back to Britain for post-war trials. A complete Panther and a complete Jagdpanther produced this way are now at the Bovington Tank Museum, Dorset, with brass plates on them, explaining their history. Jagdpanther equipped heavy antitank battalions (Schwere Panzerjäger-Abteilungen) and served mainly on the Eastern Front. 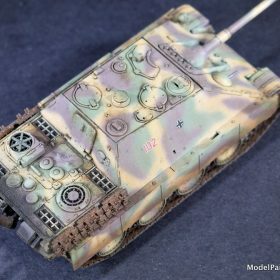 In the West, they were first encountered in small numbers late in the Battle of Normandy, where the German 654 schwere Panzerjäger-Abteilung (“654th Heavy Antitank Battalion”) deployed about 12 Jagdpanthers against British units. Later, significant numbers were concentrated in the West for the Ardennes Offensive. 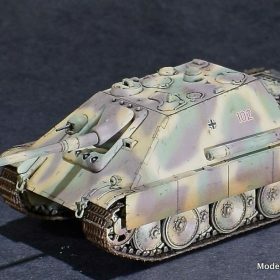 Three surviving Jagdpanthers have been restored to running condition. 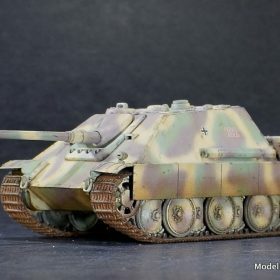 Two German museums, the Deutsches Panzermuseum at Munster and the Wehrtechnische Studiensammlung (WTS) at Koblenz, each have a running Jagdpanther. 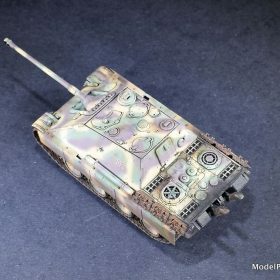 The SDKFZ Foundation in the UK has restored one Jagdpanther to running condition, using two wrecked Jagdpanthers to complete one. The other wreck will also be restored. Bovington Tank Museum, Dorset, UK—one of a number assembled by British Army Royal Electrical and Mechanical Engineers for trials, late production model. The Wheatcroft Collection in the UK owns a small collection of parts of Jagdpanthers and hopes to restore one. The kit is nicely detailed with surface details rendered in relief an inscribed. As with my aircraft builds, Tamiya Thin Cement was used for most of the larger pieces and thick CA glue by Bob Smith Industries for smaller parts. The drive, road, and idler wheels are each composed of halves making for 24 little wheels rolling around my bench at one point. Since I’m used to two mains and a tail wheel, I developed a brief case of wheel anxiety. 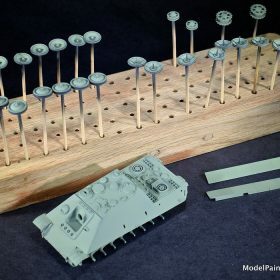 Fortunately, a couple of friends from IPMS that are accomplished modelers, (Eric C., Bruce B., and Aaron H.) gave me some good pointers on this and other tank-related issues I encountered. Aside from my axle anxieties, the build was straightforward with no problems whatsoever. The one small issue is the hole that has to be carved in the mantle piece permitting the barrel to be added. With this done, I prepped all the main parts for priming and turned my attention to painting the tracks. Prior to priming, the track pieces were soaked in denatured alcohol to remove mold release. 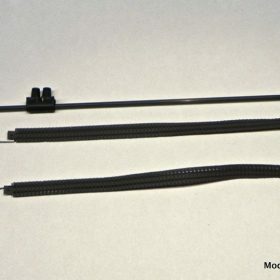 I fashioned a “Track-Rack” using a set of Berma Multiclamps and some safety wire, which did a good job of giving me easy access to the tops/bottoms of the tracks while painting. Detailed suggestions for diluting and spraying Mission Primers and Paints are provided in the Technical Notes section below. Step 2) Mission custom “Track” color prepared by combining the following Mission paints: Standard Rust, Rotbraun, and Worn Tire. NOTE 1: The aforementioned paints were combined using the ratios of 6:3:1 respectively. That’s 6 parts Standard Rust to 3 parts Rotbraun to 1 part Worn Tire. Prior to spraying a few drops of Mission White was added to the airbrush paint cup to lighten the hue a bit. I usually lighten all my paints in accordance with “scale effect” which can be summarized in general terms as—the smaller the scale, the lighter the color. After the tracks were dried I gave them a wash of enamel-based AK Light Rust ((AK 046). When the wash was dry, it was sealed with another coat of Mission Semi-Gloss (see Technical Notes below for diluting and spraying Mission Semi-Gloss). NOTE 2: This coat of Semi-Gloss was to protect the enamel-based wash from the enamel-based pigment fixer I would be using in the next step. When the Semi-Gloss was dry, pigments (Vallejo Burnt Umber [73.110] and Vallejo Light Sienna [73.104] were dabbed on using a short-bristled brush damp with AK Pigment Fixer diluted to ~25% with Mona Lisa odorless enamel thinner. After an additional coat of Mission Semi-Gloss to protect the pigments, small drops of a Dark Brown enamel filter (AK076) were carefully applied with a pin brush for a sense of shadows. That was a blast–My first set of tracks! But OMG my bench: Tanks is dirty. Guess I’ll have to do a little cleaning before starting that natural metal U-2 I’m working on but back to the tank…. 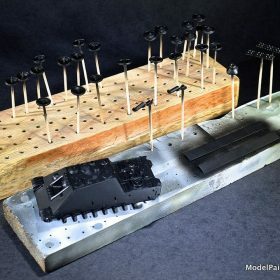 The portions of the tracks intended as joining points were scraped clean of pigments and primers in preparation for gluing. I used CA glue (Bob Smith) to join the track ends, which were held in place for drying by small clamps. The completed tracks were then set aside while I returned to building something to put them on. 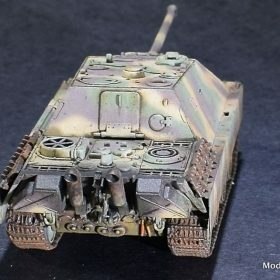 A little mea culpa here: the intended scheme of this Jagdpanther seemed to change every time I visited Missing-Lynx for inspiration. After deciding on the first scheme, the model was shot with Mission Black Primer followed by Dunkelgrun. 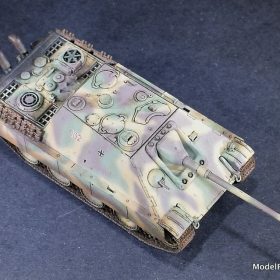 It was at this point I stumbled onto pics of a Jadgpanther in a different late-war tri-color scheme and you know what happened……. Unfortunately, my indecision necessitated spraying the lighter Dunkelgelb and Rotbraun over the darker Dunkelgrun: not impossible but not ideal either. The fact that Mission paints provide awesome coverage allowed me to get away with this. If I could do it again, I’d shoot the Dunkelgelb first followed by the Rotbraun thence the Dunkelgrun: ah well. This scheme was an exercise in fine-line airbrushing: my favorite thing 🙂 Prior to painting the scheme, the skirts, mantlet, and barrel were held in place on the body with wads of white putty. 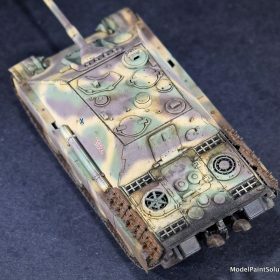 To spray the patterns of Mission Rotbraun and Dunkelgelb, both paints were diluted for Fine-Line airbrushing and shot at ~6-8psi with my newly acquired Colani hybrid-action brush fitted with a 0.15mm tip: this was pure fun. See the Technical Notes below for suggestions on diluting and spraying Mission paints for fine-line work. Fine-line airbrushing requires a working distance (airbrush tip to model) of 4-6mm or roughly ¼ of an inch. 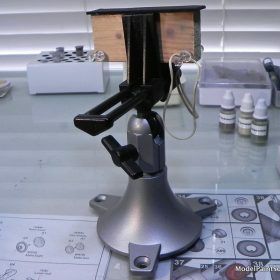 To facilitate getting access to the model for close-in airbrushing, a poseable painting stand was fashioned from a PanaVise, a block of wood, 4 push-pins, and rubber bands. You gotta love simplicity. With the scheme complete, I applied a coat of Mission Gloss in preparation for decaling. The kit decals were used and responded well to Micro-Set and –Sol. 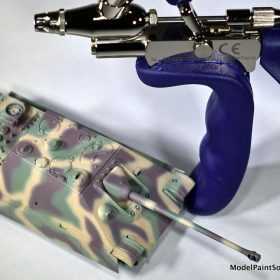 After the decals were sealed and blended with a coat of Mission Semi-Gloss, the major components (body, wheels, tracks, skirts, mantlet, and barrel were assembled with CA glue helped along with Zip-Kicker. 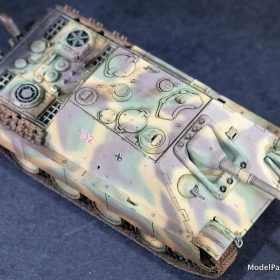 With the Jagdpanther waving its barrel at me warily from the workbench, I sat down with TankArt I by Michael Rinaldi of Rinaldi Studio Press and just started reading……. 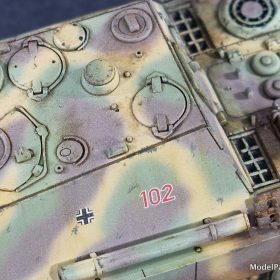 Michael provides awesome step-by-step instructions for all aspects of finishing/weathering armor models in TankArt I but the suggestions he provides for weathering with oils are simply the best I’ve read period: Thank you, Mike! Dabs of artists’ oil paints (the tube kind) are placed on cardboard or something similarly absorbent for at least half an hour, allowing the linseed oil to leech from the pigments. The dried dabs of oil pigments are then carefully applied to the model and smeared or “drawn” into realistic smudges and stains with small brushes lightly moist with weak enamel thinner like Mona Lisa or similar. Light Flesh Tone; Abteilung (ABT135), Yellow Ochre; Windsor&Newton, Vandyke Brown; Windsor&Newton. Burnt Umber; Windsor&Newton. Lighter colored (Buff and Tan) smears, runs, and smudges were applied first. When dry (~45 minutes) these were sealed with a coat of Mission Semi Gloss. When this was dry (~30 minutes helped with a hair dryer), darker weathering marks (Dark Tan and Brown) were applied and blended with Mona Lisa thinner with no concern of losing the underlying lighter weathering protected by Mission Semi-Gloss. This sequence of alternating layers of Oil Weathering—Mission Semi-Gloss—Oil Weathering—etc, allows multiple layers of weathering to be applied conferring a sense of depth to the finish. This is a really neat trick that I’ll be using again. Paint chipping was replicated with Mission Slate Grey paint carefully applied with a a small brush. Not only was this kit easy and quick: the painting and finishing was a complete hoot. I enjoyed myself immensely and learned a bunch of new finishing tricks that I’ll be using again no matter what it is I’m building. 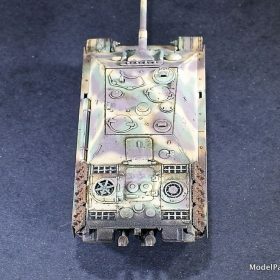 I want to send a special thanks to Brushmaster Aaron H. of Seattle IPMS for the hands-on tips he provided on weathering with oils: cool stuff! Now I gotta go paint something: maybe a tank……………. –John Kit eagerly purchased by builder. I dilute Mission Primers 1:1 or 50:50 with Mission Thinner. No Polymix should be added. If it’s a dry or hot day, I’ll add a few drops of Liquitex Flow Aid to lessen tip dry. I usually spray diluted primer at 12-15psi. 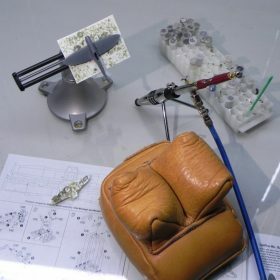 The size of the model determines the airbrush tip size used but usually between 0.20 to 0.40mm for 1/72, 1/48, and 1/35. I apply the primer first as a dry or tacky coat followed by a wet fill coat. To spray Mission paints I first prepare a solution of Mission Model Thinner to which Missions Polyurethane Mix Additive (Polymix: a flow and leveling agent) has been added to ~10%. I then dilute Mission Models Paints directly into this solution for spraying. Using a pre-mixed solution of Polymix and Thinner allows you to prepare paint dilutions in a much more reproducible way thereby ensuring the resulting mixes will spray in a predictable manner. If counting drops is how you roll, no worries. Thinner-10 is roughly 1 drop of Polymix to ~10 drops of Thinner. If you prefer to work in ratios Thinner-10 equates to a ratio of Polymix to Thinner of 1:10. I prepare a large volume of Thinner-10 (40ml) and store this in an appropriate bottle for use when painting. Properly stored, Thinner-10 lasts for many months with no issues. Dilute 60:40 with Thinner-10. That’s 6 parts Paint to 4 parts Thinner-10. Spray at ~12-15psi. Dilute 50:50 with Thinner-10. That’s 1 part Paint to 1 part Thinner-10. Spray at ~10psi or less. Dilute 50:50 to 40:60 with Thinner-10. That’s 1 part Paint to 1 part Thinner-10 and 4 parts to 6 parts Thinner-10, respectively. Spray at ~10-12 psi. I dilute Mission metallics 70:30 with Thinner-10. That’s 7 parts metallic paint to 3 parts Thinner-10. I apply diluted metallics as light, over-lapping dry coats. I let the preceding coat coat dry (sometimes aided by a hair dryer) before spraying the next coat. The metallic sheen will develop with successive coats. Dilute 40:60 with Thinner-10. That’s 4 parts Gloss to 6 parts Thinner-10. Spray at ~12-15psi. I like to build Mission Gloss up slowly using light over-lapping dry coats. Avoid getting too much gloss on the model as puddling and runs can occur. Dilute 40:60 with Thinner. That’s 1 part Semi-Gloss to 3 parts Thinner. Spray at ~12-15psi and apply as over-lapping, light, dry coats. Dilute 25:75 with Thinner. That’s 1 part Flat to 3 parts Thinner. Spray at ~12-15psi and apply as over-lapping, light, dry coats.